Joshua Dryden swears in the Snapchat video, uses a word deemed to be a racial slur and complains about them wanting items "as cheap as possible". Sainsbury's said it had "taken appropriate action". 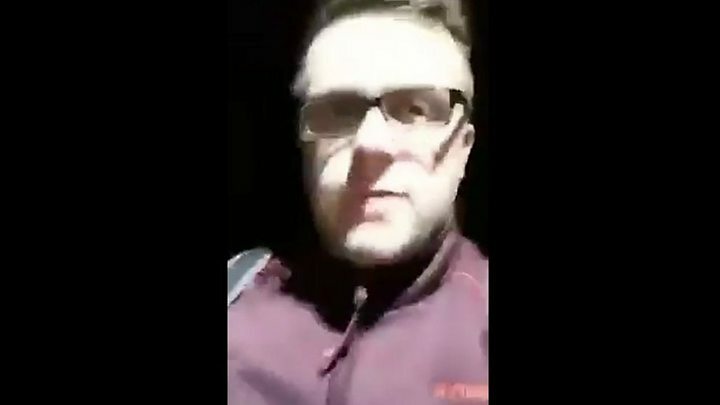 Image caption Sainsbury's said the video was "offensive and unacceptable, to say the very least"
Police said in a statement: "A man has been arrested following allegations that a video containing racist language was shared on social media. "The force received complaints about the video and an investigation was launched. "A 20-year-old man was arrested last night and questioned. He has been released under investigation while inquiries continue." Mr Dryden's Sainsbury's fleece can clearly be seen in the video, in which he recorded himself talking to the camera while walking. In part of the video he impersonates a Pakistani accent while saying: "Is this going to go down [in price] later? Is it going to go down now?" People complained to Sainsbury's after the video was shared more widely on social media and demanded Mr Dryden be sacked. A spokesman for the supermarket chain said: "We have been made aware of this video. "It is offensive and unacceptable, to say the very least, and we have taken appropriate action." Image caption Sainsbury's said it does not tolerate "discrimination of any kind"
Sainsbury's has not said whether or not Mr Dryden has been suspended or dismissed. It added: "We can't comment on individual colleagues but we're treating this matter very seriously. "We're an inclusive company and do not tolerate discrimination of any kind."